China has spent about $6 billion on its manned space program since 1992, and about half that figure went toward developing advanced capabilities for rendezvous and docking, according to an official quoted by state media. The declaration was a rare public disclosure of the cost of China's human space program, which is run by a division of the People's Liberation Army. China's crewed space effort, codenamed Project 21, formally began in 1992. The country's first human space mission launched in 2003. The state-run Xinhua news agency published the funding numbers, citing a spokesperson for China's manned space program. Since 1992, China has spent about 39 billion yuan, or about $6.1 billion, on the human space program, according to Wu Ping, a spokesperson for the China Manned Space Engineering Office, an agency within the Chinese military. China has invested about 19 billion yuan, or $3 billion, in the budget for rendezvous and docking missions, according to Wu. The $3 billion budget covers the ongoing Shenzhou 9 mission, which is due to end Friday with the landing of three astronauts after a 13-day flight. It also includes the Shenzhou 7 and Shenzhou 8 missions, plus the Shenzhou 10 flight scheduled to launch next year. China has accomplished four crewed space expeditions since 2003. The country completed its first spacewalk on the Shenzhou 7 mission in 2008. Wu did not specify whether the cost of the Tiangong 1 space lab, which is now docked with Shenzhou 9 to form a mini-space station, is included in the budget figures. Chinese President Hu Jintao visited Shenzhou 9's mission control center Tuesday and chatted with astronauts inside the Tiangong 1 space lab. President Hu asked Jing Haipeng, the mission commander, how the crew was doing after 10 days in space. Jing replied the astronauts were in good condition. "Chinese astronauts now have a home in space, and we feel very proud of our great country," Jing said. The Shenzhou 9 and Tiangong 1 complex extends more than 60 feet long and is bigger than a double-decker bus. It is a testbed for technologies leading to a larger Chinese space station the size of Russia's Mir outpost for launch in about 2020. "Seeing you there in good condition, I feel very happy," President Hu said. "How is your work carrying on?" 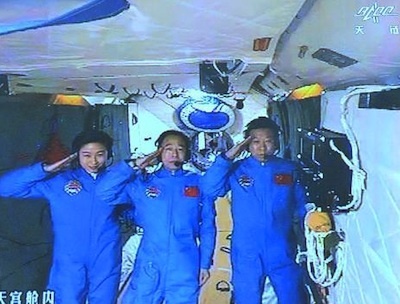 "President Hu, everything is going very well here in space," Jing said. "The manual docking has been completed, and all experiments and tests are carried out according to the plan." The manual docking Sunday was the first piloted link-up between two spacecraft in the history of China's space program. "You have performed this job very nicely, and you've done your great contribution to China's space program, and our country and our people thank you," President Hu said. "We hope that you will work there, support each other and fulfill all the tasks. All of us, and your families, are looking forward to your return."